The team at Davisville Eye Care has been carefully selected for their experience, skills and passion for vision health care. 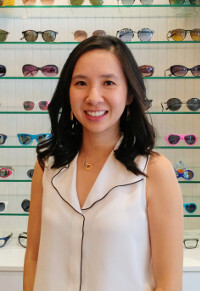 Born and raised in Toronto, Dr. Brenda Li graduated from Pennsylvania College of Optometry in Philadelphia and completed her undergraduate studies at University of Toronto, majoring in Pharmacology. She has received extensive training in diagnosing and treating eye diseases while completing her internship at The Eye Institute in Philadelphia, externships at the Veteran’s Affair Medical Center in Connecticut and at the Indian Health Services Clinic in Alaska. She is certified by the Board of Examiners of Optometry in Canada and the use of Therapeutic Pharmaceutical Agents (TPAs). Also accredited in the United States by the National Board of Examiners in Optometry (NBEO) and the Treatment and Management of Ocular Diseases (TMOD). 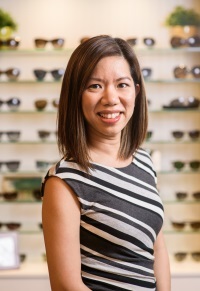 Dr. Brenda Li is currently a member of the Ontario Association of Optometrists (OAO), Canadian Optometrists in Vision Therapy and Rehabilitation (COVT&R), Canadian Association of Optometrists (CAO) and a quality assurance (QA) assessor at the College of Optometrists of Ontario. Dr. Li lives in Davisville Village with her husband, son and newborn daughter. She is proud to be working and helping the people in the neighbourhood she calls home. In her spare time, you will find her enjoying the local parks and library with her children. Dr. Li would like to extend a warm welcome to all the new patients at the practice. Come see what our beautiful neighbourhood practice has to offer. Dr. Stephanie Stanlick received her Bachelor of Science degree in Biomedical Science from the University of Waterloo. She completed her Doctor of Optometry degree as well as a Vision Science degree at Nova Southeastern University in Fort Lauderdale, Florida. While at Nova, she completed rotations in ocular disease with an emphasis in diabetes and macular diseases, pediatrics, vision therapy, contact lenses, low vision, geriatrics and primary care. She completed externship rotations at a primary care site as well as at an ocular disease site at the Veterans Affairs Hospital in Bay Pines Florida. Stephanie is currently a member of the Canadian Optometric Association, Ontario Optometric Association and the Ocular Nutrition Society. Her interests include ocular nutrition, ocular disease and pediatric optometry. 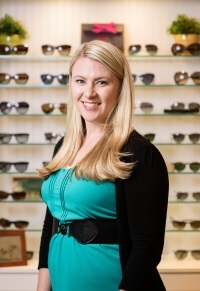 She continually looks forward to helping people of all ages achieve their optimal vision and eye health. 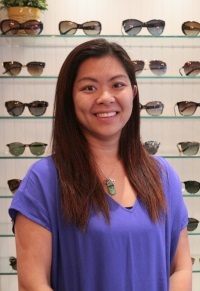 Dr. Cassandra Ng received her Bachelor of Science degree in Biomedical Sciences from the University of Waterloo and her Doctor of Optometry degree from the Pennsylvania College of Optometry at Salus University in Philadelphia. During her studies at the Pennsylvania College of Optometry, she completed clinical rotations in the Veterans Hospital in Orlando and with a large ophthalmology clinic in Maryland, working closely with several of the clinic’s ophthalmologists specializing in anterior segment disease, uveitis, and oculoplastics. After earning her Doctor of Optometry degree, Dr. Ng completed a residency in Pediatric Optometry and Vision Therapy at the Pennsylvania College of Optometry. She is an active member of the College of Optometrists of Ontario, the Ontario Association of Optometrists, the Canadian Association of Optometrists, the College of Optometrists in Vision Development, and the Canadian Optometrists in Vision Therapy and Rehabilitation. Dr. Izumi Yamamoto received her Doctor of Optometry degree from the University of Waterloo upon completing a Bachelor of Medical Sciences at the University of Western Ontario. Her training included an externship in ocular disease and therapeutics at the Lexington Veterans Affairs Medical Centre in Kentucky where she gained experience managing ocular conditions such as diabetic retinopathy, glaucoma, age-related macular degeneration, cataracts, and dry eyes. She is currently a member of the College of Optometrists of Ontario, Ontario Association of Optometrists, and Canadian Association of Optometrists. She has volunteered abroad to provide optometric care in Peru and Honduras and also enjoys volunteering within her community. She has provided eye exams to newly resettled refugees in Kitchener, Ontario and has partaken in vision screenings for Special Olympic athletes and underserved communities within the GTA. Her clinical interests include dry eyes, ocular nutraceuticals, paediatrics, and myopia control. In her spare time, she enjoys travelling, cooking, and exploring the city she is proud to call home. 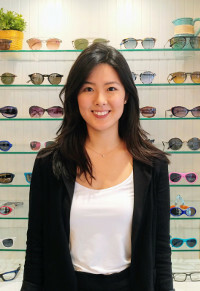 She is fluent in English and Japanese and looks forward to providing eye care to the Davisville community. Born and raised in Toronto, Ada received her Bachelor of Science degree from the University of Toronto and completed her Opticianry degree from Georgian College. Ada has been fitting glasses in the neighborhood since 2007. She has been in the industry for over 14 years. She is friendly and passionate about what she does. Ada has the eye for style and comfort to fit every individual's needs. She will fit you with the perfect frame that expresses your "eyedentity". 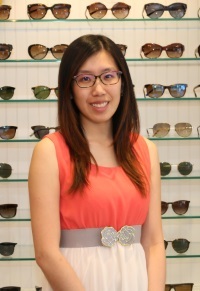 Ada enjoys spending time working on the window displays and finding the next new trend in fashion eyewear for the office. 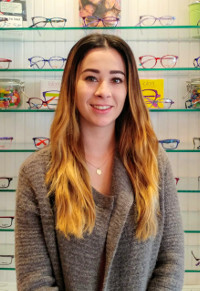 Peggy has successfully completed her Bachelor's degree in Science at University of Waterloo and completed her Opticianry degree from Seneca College. Peggy is patient and detail oriented. She has a fun personality that can brighten your day! Christine has great customer service skills with over 10 years of experience. She graduated from Centennial College and received her diploma in Medical Office Administration. Christine has a welcoming personality and will be guiding you through the appointment booking process either through phone or email, as well as answer any questions you may have. At your appointment, Christine will perform some testing before you see the doctor. Christine is our team cheerleader and our chalk board extraordinaire! 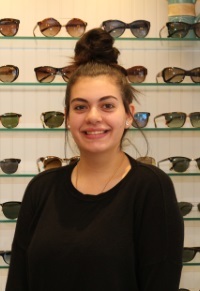 Vanessa is our newest team member at Davisville Eye Care. She studied behavioural science and is currently pursuing her Psychology degree at York Univeristy. Vanessa enjoys working with people and is the friendly voice on the other end when you call our office. Outside of work she enjoys painting and spending time with her family and friends. Nicole graduated from York University with her bachelors for Kinesiology and Health Science. In and out of school Nicole has been involved in developing fitness and health programing for people of all ages but has a passion for working with kids. Her many years of teaching dance and contributing to extended elementary and high school programing has developed her skill in working with kids and putting a creative twist on activities. 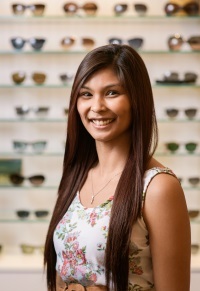 Her keen interest in health, passion for teaching and love of kids had led her to Davisville Eye Care where she can help people in their daily lives by optimizing their visual skills.